An extra ticket has fallen my way from our newest set of visitors: Bruce and Becky. It seems Becky would rather hang out in Oxford with Kathy and let me go to the Canada-Romania match in Leicester with Bruce. It would be wrong for her not to get her wish. Going through my brochures on the game venues, I find that the “if you only have time for one thing” in Leicester is the King Richard III Visitor Center. 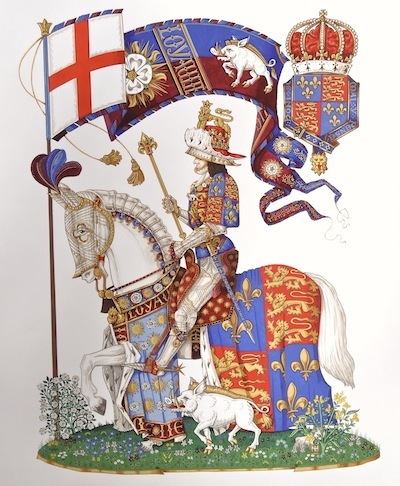 He was the last Plantagenet king of England. He lost his throne, and his life, at the 1485 Battle of Bosworth, and Henry VII took over. Richard spent the next 500 years buried under a parking lot until his remains were found there in 2012. He has since been reburied in the Leicester Cathedral. The visitor center, opposite the cathedral, tells the story of the War of Roses, which ended at Bosworth; recreates the battle and explains the discovery of Richard’s remains and identification by DNA. Not sure we will have time to take in all of that, but it is also Haka Day Out, where the audience is invited to learn and join in a Maori haka. Posted on October 5, 2015 October 5, 2015 by jbsaulPosted in TravelTagged Leicester, Leicester Cathedral, Richard III, War of Roses, Wars of the Roses.